Fighting food insecurity, blight, and gentrification by empowering self-sufficient growers. Our project will provide leasable land (for $1/year), tools, supplies, and support for people living in blighted Memphis neighborhoods. They will become self-sufficient growers, using a permaculture model. As members of the C-3 Land Cooperative, resident growers will have a strong, democratic voice in all their ongoing projects. Apply to recieve free vacant lot(s) for community gardens from the Shelby County Land Bank. Clear lots of debris from demolished homes. Till and add soil amendments. Build chicken coops and obtain chicks. The C-3 Land Cooperative was formed as a nonprofit corporation in May 2017, using a community land trust model. Part of our mission is to make land available for projects and activities that improve the quality of life in economically disadvantaged, Memphis neighborhoods. Additionally, we seek to protect the natural environment, the long term health and safety of the community, and promote the ecologically sound use of land and natural resources in these neighborhoods. Our first project is C-3 Cooperative Gardens. We belive that growing your own food is empowering. Residents of South Memphis in zip codes 38106 and 38126 face many economic challenges. More than 60 percent are not in the labor force or unemployed. And the majority of those employed earn less than $30,000 per year. Food insecurity in an ongoing challenge for this community. There are many who have the skills and desire to grow their own food. But 48 percent in 38106 and 87 percent in 38126 are renters. So they don't have the freedom to cultivate the property where they live. We believe access to land is empowering. Thousands of blighted, vacant lots fill the community. These lots are offered for sale by the Shelby County Land Bank. However, even the most inexpensive lots are financially out of reach for most South Memphians. Debris from demolished homes must be cleared to make the lots usable for growing. Soil amendments must be added and the land cultivated to prepare for planting. This presents additional barriers for residents without adequate money or tools to begin growing their own food. We believe that shaping what your community looks like is empowering. Our goal is to provide the means for community members to grow their own food and become self-sufficient urban growers. Once residents sign on as growers in the C-3 Land Cooperative, not only will they have access to land, tools, supplies, and support, but they will qualify to nominate board members, vote in board elections, and vote on future C-3 projects and initiatives. The citizens, who have a stake in the community, will help decide it's direction. Thank you to Claire, Beverly, Roy, Mila, Andria, and Arin J for kicking off our campaign! Your donations are greatly appreciated! Thank you to Adam White, John Marek, Scott Banbury, Shaun, Jeff W. Christina H. and Emily Yelling for your donations! Meet One of our Growers! Kenny will be one of our growers in 38106. 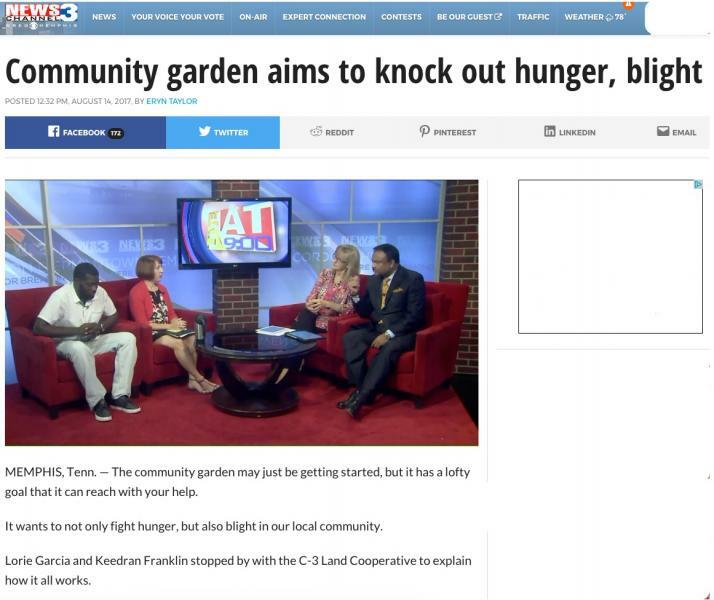 WREG came out and did a great story on him and on our project. Our program is much different from that of many nonprofits. Learn about the history of community land trusts, their benefits, and why they're increasingly being utilized today. Click the link to learn more. You may have noticed that our growers will use a permaculture model. But what exactly does permaculture mean? How is this system different from regular backyard gardening? Click the link to learn more.